It is not very often that we get the opportunity to write about the sale of a major collection of a particular series. Typically, sales of remarkable collections occur in a fast-paced auction format where bidders compete for every lot. However, the advanced collector of the Vasquez Rocks Collection of high grade Gold Dollars is taking a different approach. He selected Douglas Winter Numismatics for the sale, one of the foremost dealers of U.S. Gold in the country. Mr. Winter’s expertise, tremendous background, and of course his ability to market coins that have a wonderful story makes him the logical and wise choice for the sale of this fascinating collection. The Vasquez Rocks Collection was 18 years in the making, and it may not be the finest collection of One Dollar Gold ever assembled, but it surely ranks near the top. The collector is so fanatical about not only purchasing the best coin for the money but also the best quality coin for the grade. In this case, the One Dollar Gold series was a particular challenge, albeit quite enjoyable for the collector. It takes a wealth of knowledge to understand all the intricacies of each date in the One Dollar Gold series. We are similarly aware of another major collector who is on path for the highest graded One Dollar Gold series as well. In fact, he purchased two of the highest graded coins from this set. Many of the better dates and grades from the Vasquez Rocks Collection of One Dollar Gold are charted below. For comparison we have also listed the current FMV, the number of coins certified by NGC and PCGS combined at a higher grade, and the highest grade certified for the date. There were a total of 83 coins in this set. As mentioned earlier, this collector took his time looking for quality. Before announcing the sale, the majority of coins were sent to the grading services for the + designation and also to CAC to see which coins would receive the ultimate sticker. This meticulous strategy paid off as 39 of these coins received the CAC sticker. Ten of those coins attained both the + and CAC features and one other received only the + designation. Ultimately, it takes time to complete any series. It will also take an appreciation for the history of coins, especially those dating in the 1800’s, understanding most importantly that the minting process was not nearly as advanced as it is today. 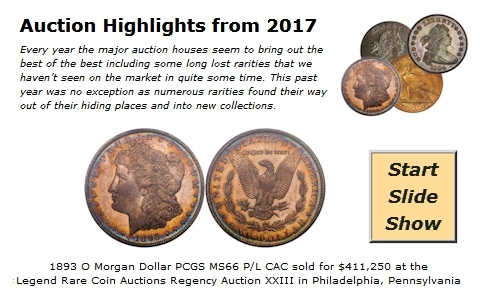 Thus, strike, die characteristics, planchet marks, eye appeal, original mintage, and certainly the number of coins certified by NGC and PCGS are all important to the individual collector. Be sure to remember that the time spent in studying each and every coin can be its own reward in the end.